Mike Salmon, who has died at the age of 82 after a prolonged illness, was a long-time racer with 13 starts at the Le Mans 24 Hours to his name. Salmon's career as an amateur driver spanned six decades and included a top-six finish at Le Mans and a British Touring Car Championship race victory, and he was still competing into his 70s. The first of Salmon's 13 Le Mans participations came in 1962 with his own Aston Martin DB4GT Zagato, but it was the following year that he made his name at the French enduro with what turned out to be his best result. Sharing a Maranello Concessionaires-run Ferrari 330LMB with Jack Sears, he finished fifth overall. "We made up our minds that we were going to drive to finish rather than drive to impress," says Sears. "There were three four-litre 330LMBs in the race and ours was the only one to get to the end, although we had our problems along the way." Salmon would go on to race for Maranello Concessionaires, the UK Ferrari importer run by Col Ronnie Hoare, at Le Mans in 1965 and '66, driving a 250LM and then a Dino 206S. 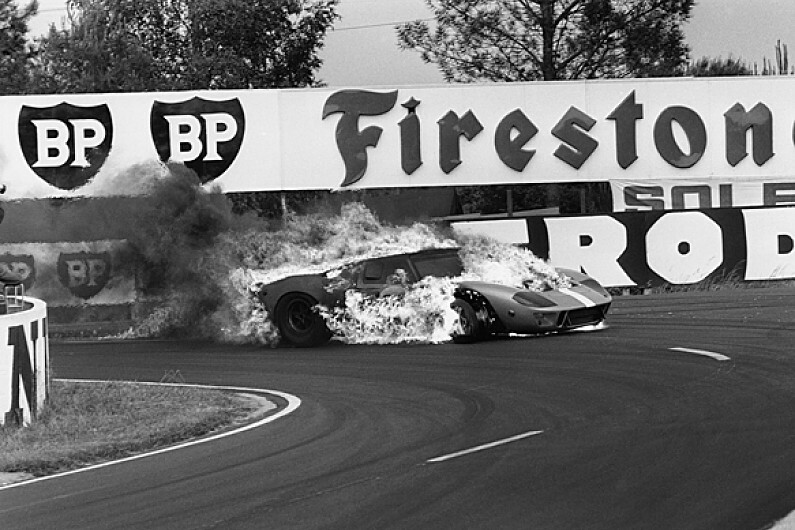 An appearance in a JW Automotive-run Ford GT40 at Le Mans in 1967 left him with serious burns to his arms and face after the fuel cap was incorrectly replaced at the car's first pitstop. After one more Le Mans start, also in a GT40, he made what turned out to be a temporary decision to retire from racing: he would return to the cockpit in the historic ranks in the mid-1970s, driving among other things the Aston Martin 'project car' he had taken to Le Mans in 1964. Salmon was back at Le Mans at the wheel of Robin Hamilton's Aston Martin AMV8 RHAM in 1977 and '79 and would become a regular on the grid for the 24 Hours in the early-1980s. He raced Group 5 Ferrari 512BBs in 1980 and '81 and became a stalwart member of the Viscount Downe's Aston Martin-Nimrod squad through the 1982, '83 and '84 seasons. Together with Ray Mallock and Simon Phillips, Salmon finished seventh at Le Mans in the first of those years and would have ended up much higher but for a dropped valve. "Mike was a very smooth and sympathetic driver," says Mallock, whose fledgling team took over development of the Lola-built Nimrod NRA/C2 for 1983. Richard Williams, who was team manager for Viscount Downe, recalls a "perfectionist with a lot of talent". Those talents stretched to mimicry: so good was his impression of Ronnie Hoare, reckons Sears, that "you would think he was in the room with you". "Mike was always great fun to be with; I respected him not just as a driver but also as a man," says Sears of a universally popular man. Mallock, who describes him as a "real character", even named his children after Salmon and his wife. Salmon started racing in Jaguars in the mid-1950s and claimed major national-level victories with an ex-Ecurie Ecosse D-type in the Martini Trophy at Silverstone and the Autosport 3 Hours in 1961. He also enjoyed success in touring cars in the first half of the 1960s, initially in a Jaguar MkII and then a Ford Mustang. Salmon claimed a European Touring Car Championship victory at Brands Hatch in 1963 in the Jag together with Peter Sutcliffe, only to be disqualified for engine irregularities, and then took his lone victory in the BTCC, then known as the British Saloon Car Championship, in the Mustang at Snetterton in '65. Involved in the motor trade throughout his career, Salmon was sales director at Maranello Concessionaires before moving to Jersey, where he set up a dealership specialising in Ferraris and Alfa Romeos. Salmon is survived by his wife Jean (nee Bloxham), who was also an enthusiastic club racer before their marriage.